Smile! 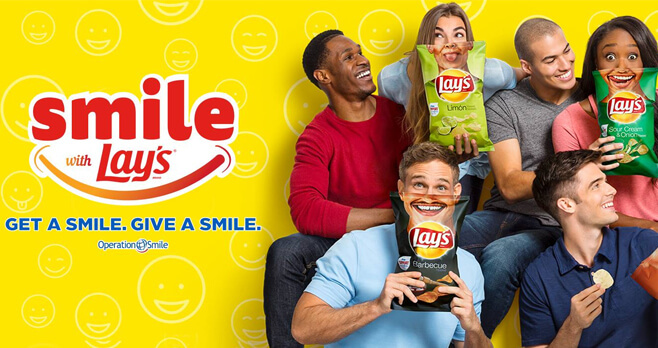 The LAY’S Smiles Sweepstakes 2018 is here. Text SMILES to 72645 to enter for a chance to win a trip of a lifetime. One lucky winner will receive a $1,500 airline vouche, $1,500 hotel voucher plus $750 cash to plan the trip that will make them smile. Who Can Enter? The LAY’S Smiles Sweepstakes 2018 is open only to legal residents residing in one of the 50 U.S. states or the District of Columbia who are 18 (19 in AL and NE) years of age or older at the time of entry. When To Enter? Sweepstakes begins at 12:00:00 p.m. (noon) CT on February 19, 2018 and ends at 11:59:59 p.m. CT on March 19, 2018. What Is The LAY’S Smiles Sweepstakes Prize? The Grand Prize consists of one (1) $1,500.00 airline voucher; one (1) $1,500.00 hotel voucher, and $750.00 (awarded in the form of a check, payable to winner). Who Are The LAY’S Sweepstakes Winners? For the names of the winners, send a self-addressed, stamped envelope to be received by April 30, 2018 to: Lay’s Smiles Sweepstakes Winner’s List, 10 South 5th Street, 7th Floor, Dept. 880-772, Minneapolis, MN 55402. I LOVE LAY’S POTATO CHIPS.